First, and foremost, the Constitution was created to protect the citizens’ individual rights from his own government. Should an employee of the federal government be afforded the protection of the Constitution, especially the 5th Amendment, when that person has abused his federal power, after he acted contrary to the very Constitution he now hides behind? Question: Does the Bill of Rights protect citizens from government excess? Nearly everyone will agree that it does. The very reason we have a Bill of Rights is to protect you, the citizen, against abuses by government. Next question: Can the government use the Bill of Rights as a shield in order to violate your constitutional rights? Nearly everyone would say this is the opposite of what the Constitution is designed to do. Yet, in practice, that is precisely what happens. Here’s how. Government officials confidently commit crimes against you, against your nation, and against your Constitution. Their confidence, their arrogance, really, stems in large part from the fact that, if and when their crimes come to light, they can hide behind the Fifth Amendment. Perverting your right to be protected from them, they shield themselves behind your rights while violating your rights. Is this not the definition of tyranny? This perversion protects government officials from having to testify about their crimes – which, through them, become the crimes of government. Thus, not only do they avoid punishment, but their immunity encourages further lawlessness by others in the halls of power. Let’s be clear. If a government official is caught shoplifting, he should be afforded the full and complete protections of the Constitution. Such a crime is not a crime of government, but that of a private citizen. It is a completely different story, however, when the government official uses his office, his powers of government, to violate your rights, the very rights that government is sworn to protect. In such a case, it cannot have been the intent of the Founders to protect the government against those whose rights the government abuses. It should be crystal-clear that the government does not have the right to hide its crimes, nor to be shielded by a Constitution designed to protect citizens from governmental abuse. It should be just as clear that every government official has an affirmative duty, an absolute duty, to uphold the Constitution. This means that if a government official becomes aware of official crimes being committed against the American people, by government, then he must report it. He must make it public, or at least as public as national security permits. What seems less clear is whether the official has an affirmative duty to report governmental crimes that he himself commits. But there is no unclarity. The Constitution is not a suicide pact. It does not protect the government by shielding it from any crimes committed by use of its authority. Fifth Amendment protections do not protect the government, nor do they shield any office-holder acting under his governmental authority – because during the commission of that crime, he is the government. The bottom line is that, when accused of an official crime, no government official has any rights under the Fifth Amendment to refuse to reveal all he knows about that crime. If this amounts to self-incrimination, so be it; in such a case, the Constitution he abuses against his victims offers him no protection against self-incrimination. None. Instead, it protects his victims against him. Any other conclusion is tyrannical. Whether it be Lois Lerner, Peter Strzok, Hillary Clinton, Eric Holder – the list is disappointingly long – every one of them is required to reveal every item of knowledge he has, in order to protect you against them. This needs to be tested in the Supreme Court. Indict one of them, require his truthful and complete testimony, and then let the appeals process begin. If there is any hope for the future of our nation – if there is any hope of forestalling the accumulating forces of tyranny – the court will protect you, not the corrupt officials victimizing you. This entry was posted in General, National Security and tagged 5th Amendment, Abusive Government, Bill of Rights, Constitution, Eric Holder, Federal Power, Hillary Clinton, Individual Rights, Lois Lerner, Nation, Peter Strzok, Supreme Court, Tyranny on December 21, 2017 by admin. Click here for the original Townhall article. As the House and Senate work their way through the tax-cut-and-reform effort, let me make one thing clear: Both plans are pro-growth where the economic power comes from the business side. And where it comes from the personal side, there will be very little growth. That was always the bet. During the spring and summer of 2016, economist Steve Moore and I, working with Trump campaign officials Steven Mnuchin and Stephen Miller, saw major tax reductions for large and small businesses as the centerpiece of the candidate’s tax policy. Whatever Congress came up with on the personal side, so be it. So one way or another — even with the glitches and differences between the House and Senate tax plans — Congress will come up with a significant pro-growth bill because business tax cuts are still the centerpiece. And they should do it this year. I spoke at the Senate Republican breakfast in Washington last Tuesday. The whole leadership was there. And I observed a total commitment among the GOP senators to get a tax bill through by year-end. This will not be another health-care breakdown. Particularly after recent GOP electoral setbacks, the party knows it needs a strong tax-cut and economic-growth narrative for the 2018 midterms. If Republicans don’t get it, they’ll lose control of Congress. And if they do get it, they may pick up seats. The political stakes are high. As mentioned, there are glitches in both the Senate and House tax plans. But most of them can be corrected. And the differences between the two plans should narrow in conference. The all-important business tax rate will come down to 20 percent from 35 percent. That’s the key to economic growth. And the biggest beneficiaries will be middle-class wage earners. The issue of small-business pass-throughs is not completely resolved. It seems the Senate has a better take on this than the House. But there’s a small-business tax cut coming. The Senate’s idea to phase in the new corporate tax rate in 2019 is a bad idea. (President Trump agrees.) To be sure, the GOP senators want full cash expensing for capex projects for 2018. Good. But as Art Laffer warns, if you hold back the actual rate reduction, you’ll see a lot of tax avoidance and sheltering next year. That will include offshoring. A delay will deter foreign companies from coming to the United States. You may wind up losing revenues — perhaps $100 billion. 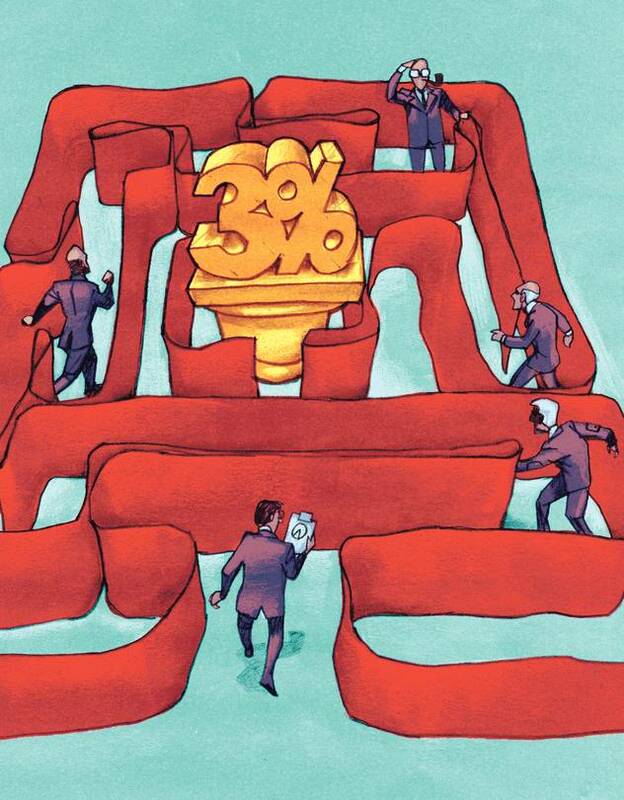 On the House side, the so-called “bubble rate” of 45.6 percent is also not a good idea. It’s being done to claw back the 12 percent rate high-end earners move through on the way to 40 percent. But why punish success? Those upper-end folks are largely investment-oriented. As FedEx CEO Fred Smith says, it’s time to stop punishing investment. That includes businessesand individuals. Let the Democrats be the class warriors who tax the rich. GOP stands for growth. I assume this will be fixed in conference. There are other issues. The personal side is a mishmash of credits and deductions. This is no Reagan bill of 1986. Good tax reform slashesindividual rates so that reductions and loopholes are no longer necessary. But there’s no slashing on the personal side, and it will be a fight over deductions. And frankly, I’m underwhelmed by the deduction part. I keep thinking: Why didn’t the House and Senate simply agree on a 3 percent growth rate? And why haven’t they embraced the Trump administration’s argument that the business tax cuts will pay for themselves and generate 3 percent growth over the next decade? House and Senate negotiators agreed on a 2.6 percent growth baseline. It’s better than the CBO’s 1.9 percent. But with 3 percent, they would have picked up $500 billion to $700 billion in additional revenues from faster growth. Unfortunately, no model captures the significant pro-growth effects of international flows, such as repatriation and the possible capital inflow from foreign companies. Is it possible this could be changed in conference? Just a thought. Of course, that old bugaboo is back: the Byrd rule. It annuls tax cuts if they promote deficits after ten years. So here’s another thought: Senate Majority Leader Mitch McConnell used the nuclear option to end the filibuster on Supreme Court justice Neil Gorsuch. So why not nuclear-option the Byrd rule? Vice President Mike Pence is ready in the wings to override any objection. The GOP must not let process stop growth-producing tax cuts. Growth is too important. So let’s play hardball, GOP, and do what’s necessary to get these pro-growth tax cuts legislated and signed before year-end. That will move the American economy back to the top of the worldwide heap. As JFK and Ronald Reagan argued, when we are strong at home, we’re strong abroad. This entry was posted in FInancial on November 16, 2017 by admin. Simple, brilliant and the right thing. Click here for the original WSJ article. Killing the individual mandate can serve the cause of tax and health-care reform. Republicans in Congress are plowing ahead on tax reform, and one obstacle is the complexity of Senate budget rules that limit how much taxes can be cut. The good news is that for once Washington’s fiscal fictions could be deployed to improve policy by repealing ObamaCare’s individual mandate as part of tax reform. The Senate Finance Committee on Thursday released the details of its tax proposal, which includes a permanent 20% corporate rate and more. Senators Pat Toomey and Bob Corker cut a budget deal to allow for $1.5 trillion in net tax cuts over 10 years without accounting for faster economic growth (and more revenues) as a result of reform. The trick is Senate procedure. The GOP is invoking a budget process that allows the party to pass the bill with 51 votes. But Republicans have to comply with the Senate’s Byrd Rule, which says the legislation can’t add to the deficit beyond the 10-year budget window starting in 2028. The Senate draft doesn’t meet this standard, so some parts of the bill may have to expire after a decade unless Republicans can fill the hole. It’s a shame this process pummels good policy. Enter the idea of repealing ObamaCare’s individual mandate. The Congressional Budget Office predicts that dumping the mandate would “save” $338 billion over 10 years—and the savings continue in the following decades. The budget gnomes assume that if people are not forced to buy health insurance, fewer people will sign up for subsidies or Medicaid. The idea that millions of people will dump free health care is one oddity of CBO methods, but that’s an editorial for another day. Some Republicans are traumatized from the GOP’s health-care failure and don’t want to complicate tax reform with fights over insurance coverage. But remember that Chief Justice John Roberts called the mandate penalty a tax. This is a political fight the GOP can win: If you like your ObamaCare plan, you can keep it. If you don’t want it or can’t afford it, you don’t have to pay a penalty. There would be no changes to benefits or coverage for pre-existing conditions, and not a dollar taken out of Medicaid, a word that would appear nowhere in the bill. Note that the mandate is a tax on the poor. More than one in three households that paid the “individual shared responsibility payment” in 2015 earned less than $25,000 and more than 90% made less than $75,000, according to IRS data. For instance: More than 34,000 families in Maine paid $15 million to the government for the high privilege of not buying ObamaCare. Repeal would be tax relief for low-income families. Republicans can use the money or lose it. We’re told the Trump Administration has drafted language that would expand the mandate’s “hardship exemption” that frees more people from the penalty. CBO may also revise its methods and thus its cost estimate in the coming months. In other words, why would Congress pass up this one-time-only offer of free money for tax reform? Another dividend is that health-care reform may be easier in the future when CBO can’t terrify the public with fanciful estimates of how many Americans would lose coverage without the mandate. CBO has a lousy record of predictions—ObamaCare enrollment is 60% below its estimate—but the media treat the place as if it were run by oracles. Democrats will call repeal a budget gimmick, and they would know: The Affordable Care Act included a long-term care program that was written to collect premiums and then go bankrupt to game the 10-year budget window, and it counted a federal student-loan takeover as a money-maker for Treasury. All of this was fiction. But repealing the individual mandate is not a ploy; it’s a GOP priority. Senate Finance this week will mark up its bill, and the best move for tax and health-care reform is to include the mandate repeal. This is a case where budget scoring can serve the cause of good policy. Mr. Quarles could be one of the most significant benefactors to the economy. He understands the relationship of regulations to business expansion; they are inversely related, as one goes up the other goes down. The last eight years unders his predecessor, an Obama appointee, has been like a Kafka novel – you wouldn’t believe it unless you lived through it. Commercial banks are the final gateway that controls the flow of money into the economy. Regulate us, as did Obama’s minions, and we are forced, by federal regulation, to stop lending. We stop lending and small business suffer. Small business suffers and job grow stagnates. Sound like the last eight years? For the original WSJ link click here. Progressive / Socialists aren’t that ignorant, are they? They must know that taxing and spending are self-destroying activities, that their income redistribution only works until those with money either stop building business or leave. Obama’s “Lost Decade” is the perfect example of Progressive economics. So, if better jobs and economic expansion is not the Progressives’ goal, what is? You may note that every solution the Progressive come up with leads to greater dependency on the federal government and growing federal employment. More government, more control…less freedom. Very much like Communist Russia and China or Fascist Germany. By golly, is that why they’re called Socialists? Please click here for the original WSJ article. 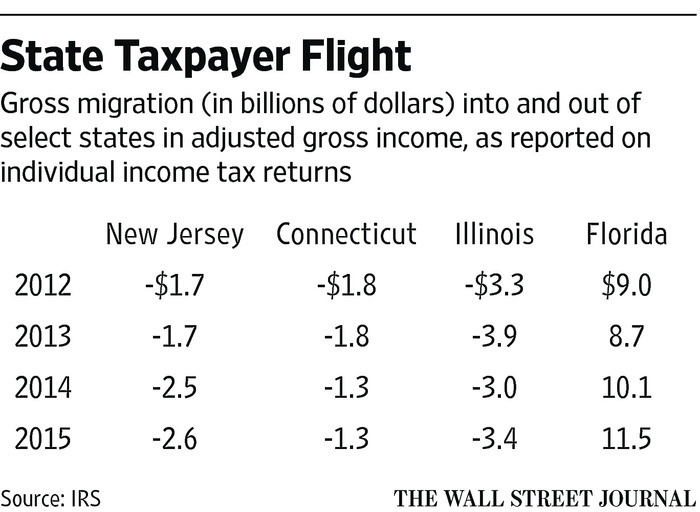 IRS data show an accelerating flight from high-tax states. Opinion Journal Video: Former CBO Director Doug Holtz-Eakin on the politics of tax reform in states like New York and California. Photo Credit: Getty Images. Democrats contend that marginal tax rates don’t matter to investment and growth, and even some conservative intellectuals are conceding the point. But the evidence from wealth fleeing high-tax states shows how sensitive the affluent are to rate increases. The liberal tax model is to fleece the rich to finance spending on entitlements and government programs that invariably grow faster than the economy and revenues. IRS data on tax migration show this model is now breaking down in progressive states as the affluent run for cover and the middle class is left paying the bills. Not surprisingly, income flows down the tax gradient. In 2015 New York (where the combined state and local top rate is 12.7%) lost a net $850 million in AGI to New Jersey (8.97%) and Connecticut (6.99%). At the same time, the Garden State gave up $335 million to Pennsylvania (3.07%), and $60 million left Connecticut for the state formerly known as Taxachusetts (5.1%). Taxpayers from New York, New Jersey and Connecticut escaped to Florida with $3.2 billion in income. Florida Gov. Rick Scott ought to pay these states a commission. The affluent account for a disproportionate share of the income migration. For instance, individuals reporting more than $200,000 in AGI in 2015 made up 57% of the income outflow from Connecticut (compared to 48% of total state AGI) and 57% of the inflow to Florida. Snowbird flight isn’t new, but migration has accelerated as taxes have increased. Income outflow from Connecticut averaged $500 million between 2003 and 2007. Then in 2009 GOP Gov. Jodi Rell raised the top tax rate to 6.5% from 5%, which her Democratic successor Dannel Malloy lifted a few years later to 6.7% and again two years ago to 6.99%. AGI outflow between 2012 and 2015 averaged $1.6 billion. In 2004 Democrats raised New Jersey’s top rate on individuals earning more than $500,000 to 8.97% from 6.37%. Between 2012 and 2015, annual income outflow from New Jersey averaged $2.1 billion—twice as much as between 2000 and 2003 after adjusting for inflation. Republican Gov. Chris Christie blocked his Democratic legislature’s attempts to reimpose a millionaire’s tax that lapsed in 2009. But Democratic Governor-elect won the election this month by promising to soak the rich even more, and his legislature will oblige. The prospect of future tax hikes appears to have propelled an exodus of high earners from Illinois, which has a relatively low and flat 4.99% income tax. Democrats raised the rate from 3% in 2010, but the tax hike lapsed in 2015 after Bruce Rauner became Governor. House Speaker Michael Madigan finally this summer secured GOP legislative support to override the Governor’s veto and reinstate the higher rate. But the tax increase won’t raise enough money to finance the state’s $250 billion unfunded pension liability, and the long-time goal of unions has been to enact a graduated income tax. The affluent know they’ll get soaked eventually and are seeking shelter. Top earners made up 47% of Illinois’s income flight in 2015 compared to 33% four years earlier. Income taxes from the 306 Cook County denizens who decamped to Palm Beach in 2015 with $258 million of income could have paid 200 teacher salaries. Alas. This millionaires’ diaspora has harmed income and economic growth. 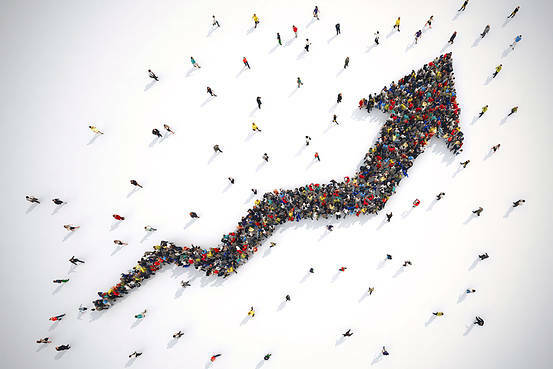 Real GDP between 2011 and 2016 grew annually at a paltry 0.2% in Connecticut, 1% in Illinois and 1.2% in New Jersey, according to the Bureau of Economic Analysis. These states were the slowest growing in their respective geographic regions, though other high tax states in the Northeast didn’t fare much better. As a result, revenues have repeatedly fallen short of projections in New Jersey, Illinois and Connecticut while budget deficits have ballooned. Democratic lawmakers have cut public services and funds to local governments, which have responded by raising property taxes. The Tax Foundation says New Jersey, Connecticut, Vermont, New York and Illinois have the highest property taxes in the country. Over the last two years, the average Chicago homeowner’s property taxes have risen by roughly $1,000. Higher property taxes hit middle-class earners especially hard and are another incentive to leave a state. As these state laboratories of Democratic governance show, dunning the rich ultimately hurts people of all incomes by repressing the growth needed to create jobs, boost wages and raise government revenues that fund public services. If the Republican House and Senate tax-reform bills follow through with eliminating all or part of the state and local tax deduction, progressive states will have an even harder time hiding the damage. They should be the next candidates for reform.